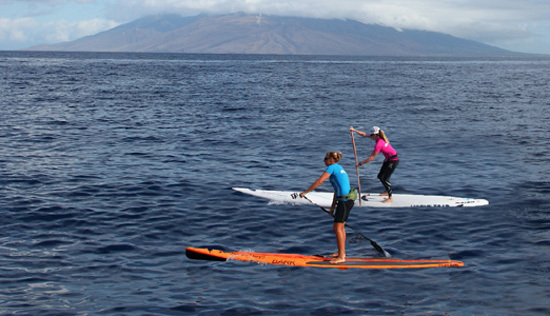 If you’ve completed a Molokai-to-Oahu channel crossing on a standup paddleboard, what’s the next challenge? For Hawaii standup standouts Jenny Kalmbach and Morgan Hoesterey, it was obvious. You travel the length of the Hawaiian Islands on your paddleboard (about 208 nautical miles), explore the nooks and crannies on each island and raise awareness about the impacts of plastic contamination in our oceans and on marine life and the human food chain. So, Hoesterey, of Honolulu, and Kalmbach, of Kailua-Kona, launched Destination 3 Degrees, which reflects the three degrees of latitude and nine open-ocean channels that separate the Hawaiian Islands. Their month-long adventure is chronicled in the documentary “Destination 3 Degrees,” which has its Big Island premiere Saturday, Dec. 4 at the 7th annual Kona Surf Film Festival at the Mauna Lani Bay Hotel & Bungalows. Kalmbach, an ocean recreation specialist, and Hoesterey, a photographer who also works for Wet Feet, needed sponsors and figured documenting the journey would be a good selling point. Hoesterey recruited her friend Chris Aguilar, founder of Soul Surf Media Productions, to film and photograph the trip. With Aguilar onboard, the women still spent eight months planning and plotting before they set off April 7 from the Big Island’s north shore. One captain pulled out at the last minute, not wanting to be responsible for the duo’s safety. Kalmbach fought off a sore throat and nausea. Hoesterey hit a mental block early on, but powered through. 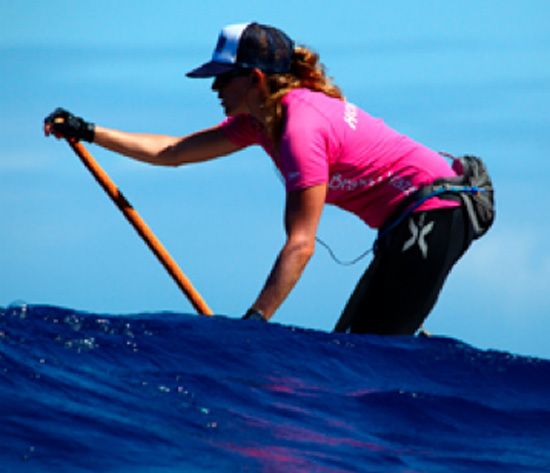 “It was all crazy, but if it had been easy, it wouldn’t have been such an adventure,” said Kalmbach, Battle of the Paddle champion in 2008 and one of Standup Paddle Magazine’s top woman boarders in 2009. At one point off Molokai, several false killer whales joined the journey. Kalmbach said she looked down and realized they were as long as her 17-foot board. Looking back, Kalmbach said the 82 miles between Oahu and Kauai were the most daunting. Taking advantage of favorable weather conditions meant they paddled all through the night. Hoesterey urged Kalmbach to lie down in her board and check out the sky. Eventually, they glimpsed the red buoy that signaled they were close to the harbor entrance on Kauai. Kalmbach said she was craving chicken soup, but the best thing on offer were Jolly Rancher candies. Although the adventure is complete, Kalmbach said the mission has just begun. “At the time, I thought it was cool to do and I can appreciate we created this opportunity to raise awareness and help find solutions,” she said. Kalmbach said that pollution is not just bad for the environment and is now entering the food chain as fish are ingesting bits of plastic, which end up on dinner plates. Kalmbach said she hopes to inspire people to make little changes in their daily habits and think about how much plastic they can live without. And she also hopes to inspire people to create their own adventures. Kalmbach said she sees parallels between her sport and the health of our oceans. The 3 Degrees journey also has a personal message. “We didn’t have permission to land on Niihau, but we got close enough for Morgan to dive down and touch the bottom,” Kalmbach said. Doors open at 4:30 p.m. and the movies begin after sunset. * Idiosyncrasies: Presents an exploration of some truly unique minds, revealing what’s behind the impact of some of surfing’s most influential underground individuals. Through their art and music, surf craft and lifestyle choices. Starring Richard Kenvin; Andrew Kidman; Lance Ebert; Christian Beamish; Tom, Leeann, Frank and Pat Curren; and Bill and Josh Mulcoy. * Dark Fall: A representation of New Jersey surfers: the lives they lead, the friendships that are made and the brotherhood that bonds surfers to this coastline. Alex DePhillipo’s award-winning documentary follows a year in the life of New Jersey’s best surfers as they tackle some of the best surf right in their own backyard and travel to remote locations across the globe. The Kona Surf Film Festival benefits the Surfrider Foundation Big Island Hawaii Chapter – Kona Kai Ea.